From hearty fried potatoes to sweet crêpes to delicate steak frying pans, they are all-rounder and indispensable for cooking. In addition to cooking pots and cookware, they belong to the basic equipment in the kitchen. The pan releases evenly heat to the grill material on the stove after a short period of time, conjuring up delicious and crispy delicacies. Wok, grill pan, iron pan, ceramic pan or stainless-steel pan - the selection is remarkable. But every meal cannot be done with every pan. Before you buy a pan, coating, material, shape, and the stove in your kitchen play a decisive role. Here you can find out which pan is best suited for you and your needs. 3. Size & Shape: From Wok to Grill Pan - Which Pan for What? Pans with a non-stick coating are universally applicable and the best choice for daily use. Whether fried eggs, meat, fish or vegetables - nothing is ever going to burn. Besides not burning, the food can be turned easily. The non-stick coating allows a fat-free, vitamin-friendly and healthy preparation. Thus, meat becomes juicy and vegetables remain crisp-fresh. After use, simply clean the pan with a soft sponge and some soap. To avoid damaging the coating and to increase the pan's lifespan, use exclusively Kitchen Supplies made of silicone, wood or plastic. Teflon pans are among the best-known models with non-stick coating. Teflon is resistant to all solvents and chemicals and is particularly suitable for food which burns quickly. Please note that a Teflon pan should not stand on a hot stove for more than three minutes without contents, otherwise its coating will suffer. The ceramic pan is one of the coated pans. Unlike their name suggests, not the pan itself, but merely their coating is made of ceramic. Ceramic absorbs the heat quickly and optimally delivers the heat to the entire surface. Thanks to high heat resistance, the frying pan does not release any harmful substances. With the addition "PTFE- and PFOA-free" designated pans are generally free of the plastic polytetrafluoroethylene and of the chemical perfluorooctanoic acid. The All Steel Pans of the Finnish manufacturer Fiskars are made of high quality stainless steel and are provided with Ceratecº ceramic coating. They can easily withstand temperatures of up to 240 degrees Celsius and are available in the sizes 24 cm to 28 cm. However, many chefs swear on uncoated pans, especially when it comes to roasting meat and poultry. Such models can be heated very strongly, so that the pores of the meat close in the shortest possible time. The meat remains juicy inside and becomes crisp on the outside. Do not add fat until the frying pan is hot. Whether with or without coating - most pans for the household are made of aluminum or stainless steel. However, cast iron pans are also becoming increasingly popular. Here you can find out, which properties the respective materials bring along. Aluminum: Aluminum is rust-free, easy to mold and light in weight. In addition, the material is relatively inexpensive and coated easily. An aluminum pan has a particularly good thermal conductivity, but it does not store the heat very long. In most cases a pan made of aluminum is suitable for the dishwasher. However, if you clean the pan by hand do not use scratchy sponges or brushes to protect the seal. Bear in mind that an aluminum pan is not extremely heatable as the material could deform over 250 degrees at high temperatures - therefore pans made of this material are not suited for gas stoves. Stainless steel: Stainless steel pans are - as their name suggests - stainless and corrosion-resistant as well as food-safe. Even though the heat conduction through a stainless steel carrier takes about 15 times longer than with an aluminum pan, the frying pans made of stainless steel store and distribute the heat considerably better. Stainless steel pans can also be heated more intensively. In the bottom of many models a thermal layer of aluminum or copper is incorporated, which provides improved thermal conductivity. Cast iron: A cast iron pan is extremely sturdy, durable and easy to clean. Pans made of iron are scratch and cut resistant, so they can not be damaged by any sharp cutlery. Cast iron provides natural iron to the food, which benefits a healthy diet. In an uncoated iron pan, the roasted aromas unfold flawlessly and impart a very special flavor to the roast. Before using the pan for the first time, use an oil to cook the pan, resulting in a natural coating that reduces fat. A cast-iron pan, such as the Frying Pan with Wooden Handle from Morsø, is massive and heavy. It stores the heat for a long time even after the stove has been switched off. Cast iron pans are especially good for fried potatoes and steaks. 3. Size & Shape: From Wok to Grill Pan - Which Pan for What?? Not only the material, but also the size and shape play an important role in the selection of a suitable frying pan. The most common are round pans with a diameter of 24 and 28 cm. Models with a size of 24 cm are suitable for nearly all dishes and generally offer space for two to three servings. Pans with a diameter of 28 cm, like the Stainless Steel Pan by the famous Eva Trio Collection, offer enough space for up to four portions. They are particularly suitable for all pancake dishes and thin crêpes. In small pans with a diameter of 20 cm, you can prepare excellent scrambled eggs, omelettes or pancakes. Also smaller portions for one to two persons fit in here. In a frying pan with an extra high edge - as is customary for the casserole, sauté pan or wok - you can prepare complete meals with meat, vegetables and sauce. The high margin makes it possible, for example, to stew and turn large quantities of vegetables gently. Pans with a low edge - the crêpes pan, the egg pan or the paella pan - ensure that you can easily turn the dishes with the pan. They are the best choice for all meals that are made with eggs. Square pans have the advantage that they have a larger usable floor space. They claim the same amount of space on the stove, but take up more roasting material. Many long dishes, such as skewers, fit better into a square pan. Above all, grilling pans are therefore frequently square. They are equipped with a ribbed floor, which provides for the crispy brown grill strips and good frying characteristics. The grill pan can be heated high and stores the heat - making them ideal for steaks. Thanks to the grooves, the food does not lie directly on the pans floor and does not stick fast enough so that you can make do with less fat. Not every pan is suitable for any type of stove. For induction stoves, only pans with a magnetic base can be used. Aluminum and stainless steel pans are non-magnetic and have to be equipped with a special floor, whereas cast-iron pans are suitable for all types of stoves. Does your kitchen have a gas stove? Then you should not use an aluminum pan, since it could quickly deform at high heat. Every pan is suitable for the ceramic hob. On the respective product page, you will find all the properties of your favorite at a glance - so make sure you decide for the right model before buying. Particularly practical: Many manufacturers offer an extensive pot set - so that cooking pot and pan match perfectly. 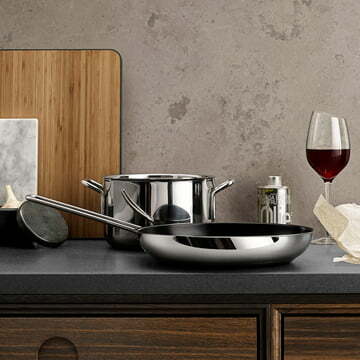 With the pot series La Cintura di Orione from Alessi your kitchen is well equipped. The pot set is also suitable for induction and comprises - in addition to a large cooking pot - various casseroles, pans and a sauté pan - so you can cook like a professional chef. The small Hardface Pans from the renowned manufacturer Fiskars cost less than 45€. In the middle price segment, between 70€ and 100€, larger models of Fiskars as well as various stainless steel and aluminum pans from Eva Solo are available. 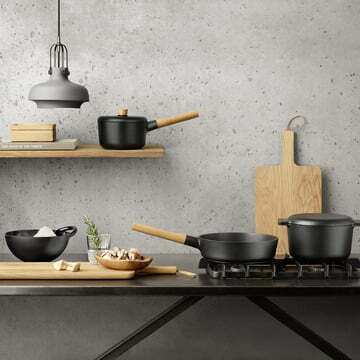 Particularly exclusive models, often developed by kitchen chefs, such as the Tools Frying Pan by Iittala, can be found in the higher price class. You want to buy a designer pans online, but need support? Please feel free to contact our customer service. We help you if you have any problems with your purchase, give recommendations and we can quickly clarify questions. Let us send you your favorite product to your home, comfortably within a few working days!